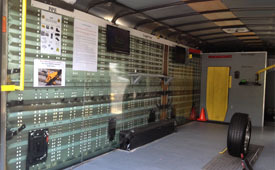 Mobile Training Center designed to provide hands-on training using simulated work stations as well as visual training and video training. 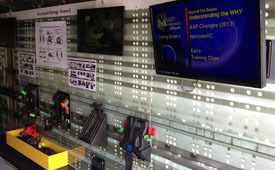 Mobile training center is self contained so as to be able to train / re-train Associates on-site. 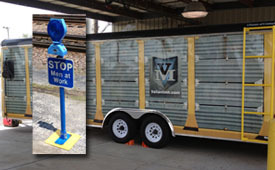 Blue Flag Signal, Derail, Railcar brakes, 3 points of contact, Entering and Exiting equipment, coupler gaps, door pins, bridge plate handling, securement installation, removal and storage. Additional training includes OSHA, Environmental and Training Modules. Training is an essential in our Industry and we have implemented a training center which brings together hands-on training, class-room training and on-line training. The training center is equipped with computers, wireless internet, a spill kit and a blue light signifying training is in session. The hands-on training includes Blue Signal operation as well as a Ladder which can be used to demonstrate 3 Points of Contact while also observing how Associates use 3 Points of Contact. 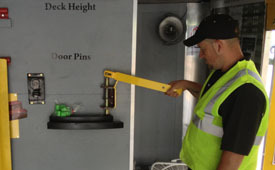 The hands-on training also includes a chock model which can be used to show the proper methods of installing chocks as well as removing them Safely. Additional hands-on devices and training include chock storage as well as bridge plate handling and placement. By utilizing all training methods, we ensure the Associate better understands the Safety aspects of their duties which supports us in providing the Right Results the Right Way while Protecting Our Associates Our Business and Our Customer. I would like to start off by thanking everyone for their contributions this quarter. Your efforts have not gone unnoticed. As I stated many times before in this space our success is a direct result of the efforts our team members put forth on a daily basis. 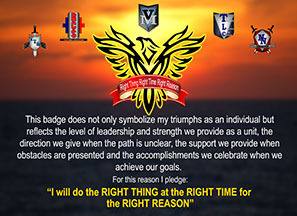 Those efforts are the building blocks and cornerstones to not only our success but our growth as well. Those building blocks are safety and quality, process’s and attention to detail. Some may say you left out customer service. I didn’t. Customer service is the mortar tying those building blocks together. Customer service digs it roots into every facet and function of our jobs. That’s who we are! A service provider for a customer, nothing more and nothing less. There are numerous tenants that make an organization a great service provider. 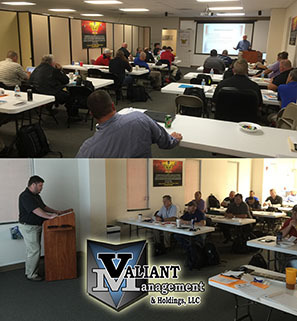 Training for Regional Managers took place this June at the Valiant Management Corporate Headquarters in Simpsonville, Kentucky. Topics included Company Policies, Environmental, CPR, Safety-Quality, Loss Prevention, Leadership, Managing Conflict, Areas to Improve In and many other topics. Vision is the cornerstone of good design and at the core of fearless innovation. The all-new 2014 Impala is proof of that, combining superior materials with meticulously crafted technology. Its bold stance and sculpted lines combine form with function to please the eye and effectively command aerodynamics for a smooth, dynamic ride. The interior is transformed into an environment of sophistication and authenticity featuring premium materials thoroughly crafted with masterful technique resulting in superior finish in every detail. Engineered for excellence. Designed for drivers. The 2014 Chevrolet Impala is a stunning reinterpretation of the premium sedan.